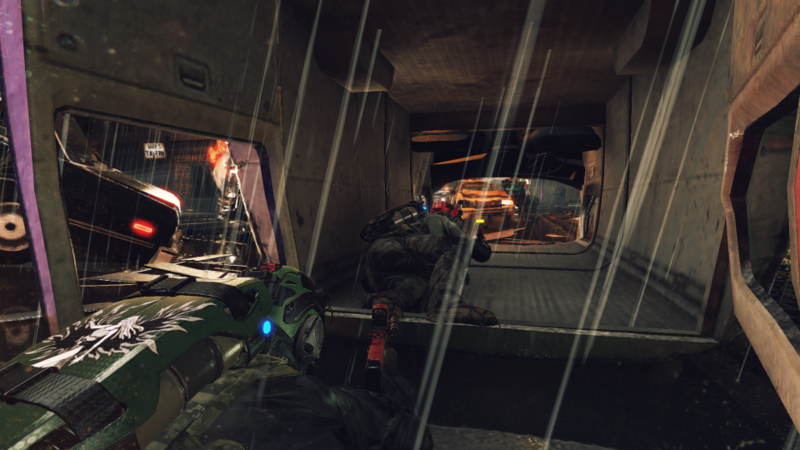 Umbrella Corps review: Bring out yer dead! Well, what a steaming load that was! Probably not the words Capcom wanted to see at the start of any review, but there’s just no nice way to say it I’m afraid. Umbrella Corps has to be one of the worst big name releases I’ve played this year, if not the worst. Umbrella Corps is one of those games where you simply can’t figure out why on Earth it exists, and by the looks of it, neither can the developer, otherwise more than a few hours of work might have been put into it. This is a prime example of blatant cash-in, which makes the whole thing all the more questionable considering Resident Evil’s less than stellar turn out of late. I’m still reeling over Operation Raccoon City, but I’m getting ahead of myself. Let’s start at the beginning. 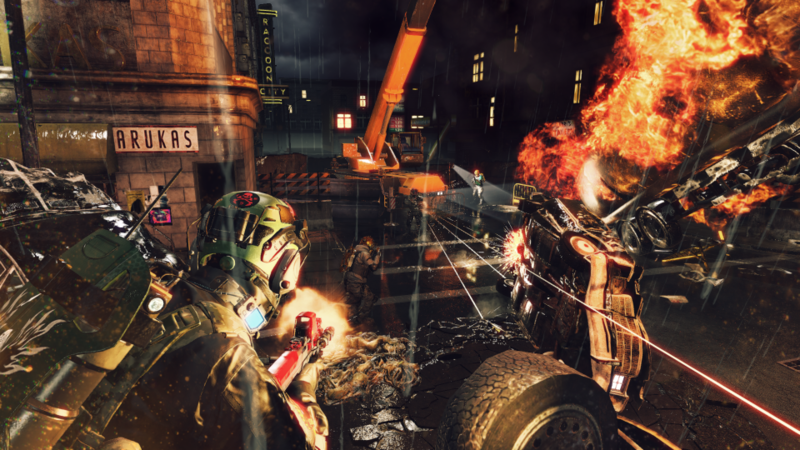 Umbrella Corps is a budget team co-op shooter that pits teams of three against each other in (very) short rounds of various match types. 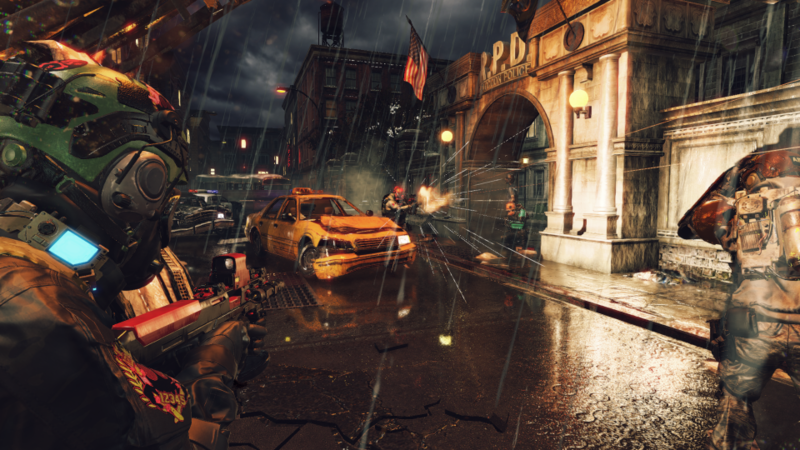 The action is viewed mainly from a rather nasty third person camera, with iron sight aiming forcing you from third to first person. 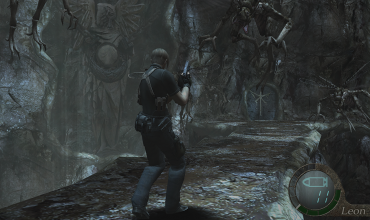 The gameplay is reminiscent of Gears of War‘s multiplayer, in that it includes cover-based combat and a more tactical approach, but unlike Epic’s series, this isn’t good, suffering from clunky controls, tiny maps, and some downright weird design that, whilst I can see the ideas on paper looking good, just don’t work in practise. You see, in each game there are your two teams of three, as well as a number of zombies. Each player starts out with a zombie jammer (yes, really) strapped to their backs. This keeps zombies at bay, making them non-hostile. However, should your jammer be destroyed, it’s brain-eating time, and you’ll not only have the enemy team to worry about, but the zombie horde as well. Sounds good, right? Well, it’s not. It is messy, unwieldy, and matches are far too short to make the feature work anyway. I’ve played many matches, most of which are over in around 1-2 minutes, and even when my jammer was destroyed, it didn’t matter for long. “None of this matters” should be their tagline. 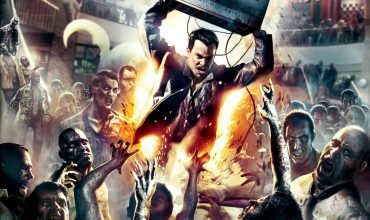 True, you can use zombies effectively, either as allies or simply bullet stops, as they make decent moving barriers, but in matches so short and bereft of incident, there’s little point. Three vs three is just far too few players for any decent match, and any long-term tactical play is usually nixed as players are downed quickly. This is most apparent in one life matches, where you’re out when you die with no respawns, but even on the multi-objective type where respawns are allowed. These multi-objective matches are perhaps one of the game’s better elements, and they play much like Killzone‘s competitive modes which change the goal each round. Here there’s a hard reset between matches, unlike the fluid transition of Killzone‘s modes, but it does keep things interesting to a degree. A very small degree. Indeed, if it wasn’t for the Resident Evil name, I may actually confuse this with the kind of tripe that gets spewed out onto Steam’s Early Access, it’s that ropey. Everything just screams mediocre, from the lacklustre visuals, comical animations, janky collision, terrible UI, and general unfinished look. It’s as if Capcom simply dug out an old prototype it had lying around. Your guess is as good as mine as to what is happening here. Bolted onto the main game are a host of character customisation options, from uniforms and masks (including badly pasted-on character faces from the main series like Wesker, Leon and Chris), as well as weapons mods, and various colours. It’s decent enough if you’re into that sort of thing, but the odds are you won’t be playing the game long enough to unlock anything good. I should also mention the so-called single-player missions. These boil down to simple, and mundane challenges on the same group of tiny maps, and are totally forgettable. They’re made up of the same mission types as the main multiplayer game, and are even less enjoyable. There’s no story save for some badly written loading screen text, and you’re simply thrown into each mission with no real reason. I may sound overly harsh, and I admit, I wasn't expecting great things, but I was damned well expecting something better than this. It makes Operation Raccoon City look like a masterpiece by comparison. Resident Evil was once a titan in gaming, not only for sales, but for quality, and it's now become a running joke. Umbrella Corps is the last thing the franchise needed, and even though Resi 7 is looking quite good, the series isn't back on its feet yet, and Capcom needs to stop milking it with poor releases and concentrate on making the name respectable again. 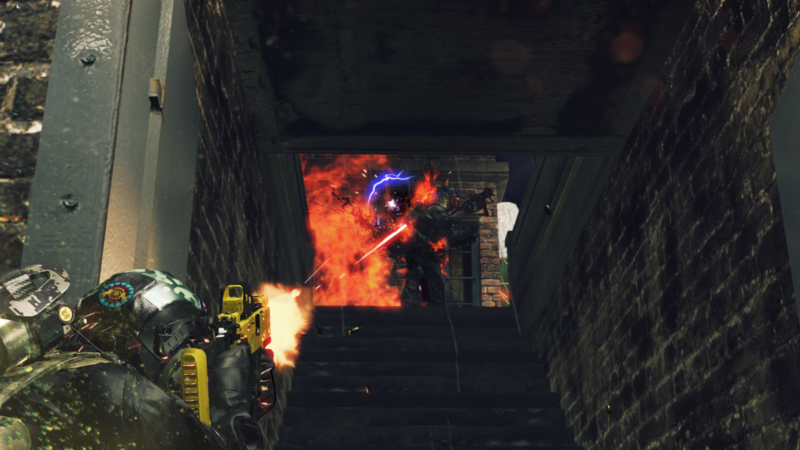 Needless to say, I recommend you avoid Umbrella Corps at all costs. For more reviews of trash games follow @load_screen on Twitter and like us on Facebook.